Start your feast as you mean to go on with chilled oysters and a bottle of fizz. Pacific (rock) oysters are available all year round but at their best in winter. Their creamy, slightly vegetal flavour is complemented perfectly by both the mignonette and the cocktail sauce. 1. For each sauce, mix together all the ingredients and then place in ramekins or glasses. Cover and chill until needed (up to 24 hours ahead). 2. To shuck the oysters, start by wrapping one in a clean tea towel and holding it firmly on a flat surface with the pointed end facing towards you. Insert an oyster knife (or other short, pointed knife) into the small gap between the two shell halves at the pointed end (called the hinge). Apply firm pressure and gently twist the knife to open the shell. Run the knife along the underside of the top part of the shell, staying as close as possible to the edge; discard the top part. Taking care not to spill any precious juices, run the knife under the oyster to release it completely. Place the bottom part of the shell on a tray lined with a tea towel, then repeat this step with the other oysters. 3. 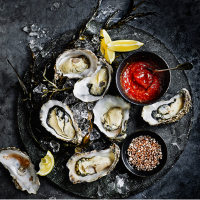 Serve the oysters immediately on individual plates, or a small platter covered with crushed ice, with the mignonette, cocktail sauce and lemon wedges alongside. This recipe was first published in Wed Jan 20 11:46:00 GMT 2016.